The Western Program at Miami University, via its individualized studies major and minor, gives students an opportunity to indulge in their passions and interests, deeper than traditional programs. Senior Katja Diekgers, a zoology major and environmental science co-major, discovered the Western Program during her freshman year through a course she originally took for a general education fulfillment. "I knew I wanted to study animals probably sophomore year of high school, maybe even earlier," Diekgers said. "Environmental science was added my freshman year because I figured it would make me look better on paper, but now I am so passionate about it and it is very important to me." Diekgers said that she never considered the Western Program until a friend minoring through the program introduced her to the opportunity. By the end of her sophomore year, she picked up an individualized studies minor focusing on ecological restoration and conservation. "The community we have [in the Western Program] is amazing," Diekgers said. "I have so many great friends that are doing such cool things." Diekgers, herself, is also doing many 'cool things' in the Western Program as well. She has studied abroad twice, worked on ecological conservation in Ohio, and works at 39°84° West in Peabody Hall. 39°84° West is an escape for Western (and non-Western) students alike. On Mondays, they host a tea and conversation, engage in a poetry discussion every Friday, and hold other small events for students and professors to gather and converse. Diekgers and several other Western students work to keep the room open and available for students. "This place is really cool, like an escape," she said. "I am always here when I am not in class." Of the classes she has taken at Miami, Diekgers said her favorite is Western professor Hays Cummins' Ecological Restoration course (GEO 280/460). Students study a plot of farmland in Ohio that is riddled with honeysuckle and other issues and work to save the land. Diekgers said that her involvement in Dr. Cummins' class and her study abroad trips have been the most valuable experiences to her. "I learn so much, with such ease, because it was hands-on. I have never been able to learn that fast before," Diekgers said. 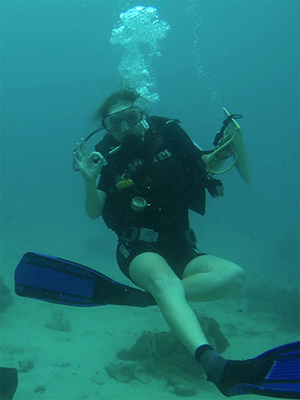 Katja Diekgers gives the OK sign while scuba diving. During her sophomore year, Diekgers studied abroad in New Zealand. The trip began in Auckland on North Island and ended in Queenstown on South Island, after the students backpacked the length of the country. "We backpacked and learned about invasive species and identifying birds and reptiles," she said. "We also talked about conservation in terms of managing invasive species." Then, last summer, Diekgers traveled to Thailand for a 4-week study abroad. While the program is not offered through Miami, she was able to fulfill Western Program credits with the opportunity. The first two weeks were focused on conservation in Thailand, specifically the forests and the oceans. She studied endangered species and how they are being affected by deforestation and increased agriculture. 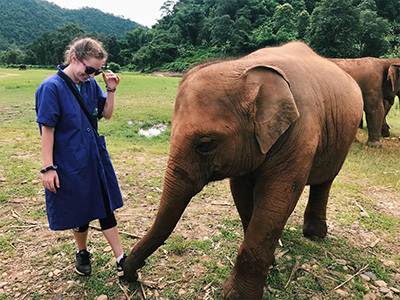 "The last two weeks were a veterinary-focused program in which I volunteered at the Elephant Nature Park, an elephant sanctuary," Diekgers said. "I really needed this program because of my love for elephants!" "It was heartbreaking learning [the elephants'] stories and why they are in the sanctuary," she added. "It is not just in Thailand where this happens to them, and most people just aren't aware." The founder of Elephant Nature Park, Sangduen 'Lek' Chailert, created a documentary about the abuse of elephants, which is shown to anyone who volunteers more than one day at the park. Diekgers said that she will never forget the eye-opening documentary. She also had a diving experience during her trip that helped her conquer her fear of the ocean, despite being a California native. "Now I want to dive so bad again," she said. "I might dive the Great Lakes during Thanksgiving with my friend from the Thailand trip." Diekgers said that the Thailand experience was exciting because she was subjected to a completely different culture than she is used to. "We worked with the Maori people and saw how tribes function and how Polynesia migrated. We also got to talk to Buddhist monks and took meditation classes with them." "I don't want to stay in one place. If I can work in Koh Tao [Thailand] for a year, that is awesome. If I can work in New Zealand studying invasive species for a year, that's amazing," Diekgers said. As long as she is doing something with conservation or wildlife, she explained, she will not be 'picky' about her future. "My advice to other Western students is to come in with a plan, but with the flexibility to derail that plan," she said.